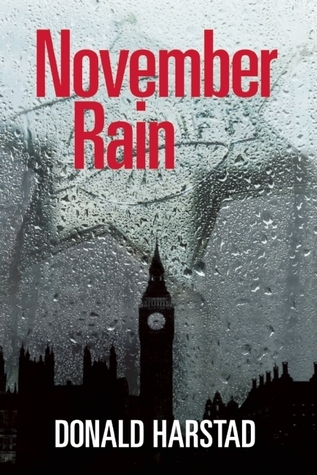 November Rain is the sixth book by the author that features his sleuth, Carl Houseman who’s a deputy sheriff in Iowa. I hadn’t read any of the other books and was somewhat worried I wouldn’t get caught up to speed on the character well enough to enjoy this story. However, that wasn’t the case. Within one chapter I felt like I knew who Carl was. The author does a great job giving insight into his personality. I knew that he loves his job, takes it seriously, and sometimes says things that made me laugh. I really enjoyed the opening scene where it seems Carl will do anything to wrangle his way out of taking the assignment in London. Lucky for the reader, his superior won’t take no for an answer. Carl heads to the UK and is thrown into a situation that becomes larger than life. It’s a sort of fish out a water scenario which I think made it a fun read. I thought all the scenes featuring Carl were great but when he wasn’t on the scene, it sort of switched to a narrator that I felt put some distance between me and the person whose head I was in, and was my only dislike of the book. It’s a fast paced tale and has twist and turns and a story that’s very relevant to today’s unsettled world. Mr. Harstad did a great job creating characters who found themselves suddenly caught up in trouble they hadn’t seen coming which gave it a page turning quality. If you’re a fan of small town mysteries that combine themes from today’s headlines then I think this one would be ideal for your fall reading.